The only links page that matters… except for all the others. Seattle screenings and cinema events are surveyed at Parallax View here. “In a zombie apocalypse (Night of the Living Dead) or a secret alien takeover (Invasion of the Body Snatchers), you fall asleep one evening and when you wake up in the morning the world has changed. Your relatives and your friends, your neighbors and the friendly folks who run the dry cleaners reveal themselves as the monsters they’ve always been, beneath the lie of civilization, of affection. They look the same, but now they want to destroy you, to consume you. And you have to keep running.” Colson Whitehead sums up the lessons learned—some silly, some transcendent—from an adolescence steeped in horror and sci-fi flicks. “The newspaper mogul and moral crusader Martin Quigley called Greed ‘the filthiest, vilest, most putrid picture in the history of motion pictures.’ Stroheim retorted, ‘You Americans are living on baby-food. '” Prompted by a Film Forum retrospective, Imogen Smith assesses what one can of the mangled filmography of Erich von Stroheim, finding a moral absolutist who knew how to please a crowd, a hyper-realist less interested in realism than in truth, and an actor forced into a series of self-parodying roles who kept finding the dignity buried therein. Among other fine links, Girish Shambu notes Here & Now, an intriguing new blog project from Michael Koresky. Picking a year, then three representative films, Koresky is attempting to parse out his own understanding of a given era by skidding backwards and forwards in time with the movies. (1948, for instance, offers the “marvelous images of Manhattan” from Portrait of Jennie, the “fixed and inescapable” frozen time of Rope, and the “desperate moment” captured in Germany Year Zero.) A nifty idea for cinema-as-time-machine, and one so far worth riding along with. As recounted by Ben Slater, there was more interesting drama behind the cameras than made it onscreen for the first American production shot in Singapore, 1969’s Wit’s End, aka Dragon Lady (“packs the punch of the Orient!”), aka The GI Executioner. With a separate collection of screenshots reminding you even the most indifferently made film invaluably documents cities now lost or never seen. Link via David Hudson. David Cairns uses two 1948 mermaid movies—the British Miranda and America’s Mr. Peabody and the Mermaid—to point out some differences between the two nations. Though it’s hardly fair to praise England for a healthier, more forthright eroticism when their nymph was played by Glynis Johns. “I took her in a limousine to Times Square, and I stopped the car, and I said [gesturing toward a massive billboard above], ‘See Ma? BRYNA PRESENTS THE VIKINGS!’ And my mother said, ‘America—such a wonderful land!’” Even at 95 and with speech slurred from his stroke, Kirk Douglas left interviewer Scott Feinberg, and the Hollywood Reporter’s transcriber, no resort other than all-caps when he bellowed the sign’s legend. “Let’s drink a toast to our brave young friend. The Light Horse.” “The Light Horse.” “The Light Horse.” “What did you mean about business interests?” Roderick Heath dissects a superficially peaceful domestic scene from Gallipoli and finds it the crux of the film’s politics, laying out the carrot and the stick that will send its two young heroes to war. The latest Iranian director not making films in his homeland, albeit voluntarily this time? Abbas Kiarostami, as he informs the L.A. Times’s Stephen Zeitchick. Video: Aaron Aradillas and Matt Zoller Seitz look back at Rocky III, whose fast-paced, crowd-pleasing spectacle became the “template for success” for movies in the 1980s. Part of a series devoted to Summer Movies from the decade. Further sign the ’80s are finally getting something of a critical re-evaluation: BAMcinématik is holding a retrospective built around the film scores of Tangerine Dream. The rundown, and several excellent samples of music with one foot apiece in gloom and grandeur, from Film Comment’s Margaret Barton-Fumo. In the first stages of a new project, London artist Sam Nightingale is building a website dedicated to the torn-down movie theaters of the neighborhood of Islington. 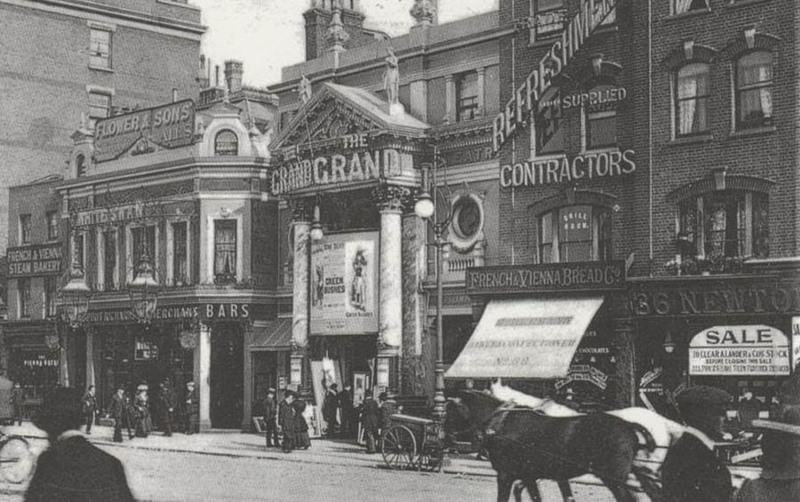 Already an attractive destination, with the sites of eight movie houses displayed in then-and-now photographs and brief but evocative descriptions, Nightingale’s ambitions are even more enticing. He sees it evolving as a repository of oral histories of trips to the cinema in bygone days. So bookmark a fun little diversion now and hope you return in a few month’s time to something quite special. Noted, along with some other resources of this nature, by the Bioscope. From a performance at the Museum of Fine Arts in Santiago, Chile comes…what, exactly? The text calls them dolls but they’re clearly stage puppets. Either way, they’re designed by Alejandro Jodorowsky and they’re creepy as hell. Spotted by Dangerous Minds. More extracurricular activities from movie directors comes courtesy of John Waters, who discusses his art with Drew Daniel at Frieze Magazine (“I love the seriousness and elitism of the art world. I think art for the people is a terrible idea. I did a piece that said ‘Contemporary Art Hates You.’ And it does.”), then explains his cross-country hitch-hiking (shockingly, a book deal is involved) to the Times’s Dave Itzkoff. Via Movie City News. “However, if for some reason or other (and I cannot imagine a reason) you cannot draw a Square, a Circle, an Oval or Triangles, do not buy this book. Put it down and save your money—you’ll need it to pay taxes.” Ethan de Seife points to a marvelous gathering of Frank Tashlin miscellany on the website of illustrator Stephen Kroninger, highlighted by Kroninger’s recent scan of the 1952 book How To Create Cartoons. I can’t speak to the pedagogical efficacy of Tashlin’s SCOTArt technique, but I can say a more delightful gallery of bosomy matrons, dramatically foreshortened pipe smokers, and runners leaning into the headwind, their limbs sharp-angled pistons, isn’t likely to pop up anytime soon. Japanese director Kaneto Shindo, born in 1912, died this week. He was 100 and had worked in the Japanese film industry almost all his life in a career that began before World War II and continued on through 2010. Though never as well known internationally as other directors of his generation, including his mentor Kenji Mizoguchi, he made an impression with The Naked Island (1960) and two vivid horror films, Onibaba (1964) and Kuroneko (1968). More from Ronald Bergan at The Guardian, who reminds us that Shindo was born in Hiroshima and was deeply affected by the legacy of the bomb and the war. As usual, David Hudson (now at Fandor) curates a collection links to remembrances. Here’s footage of Shindo on location for Onibaba, courtesy of Criterion. The weekly links page is compiled and curated by Bruce Reid in collaboration with the editor of and contributors to Parallax View.